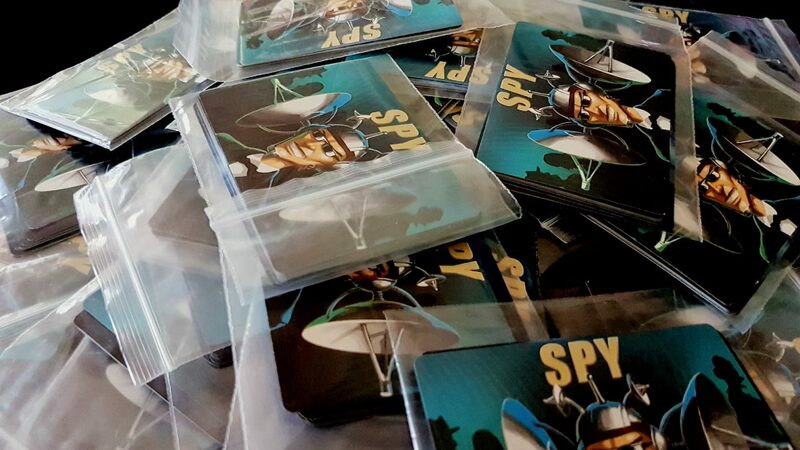 The thing about social deductive games like Spyfall is that they only really work in very particular kinds of groups, and it’s usually only at fine-balanced player counts that the real magic emerges. You need enough people of the right temperament for the alchemy to do its work. You need people that know each other so they can assess intention and behaviour, but not so well that there’s no mystery in their actions. You need to catch everyone at the right time so that you get the best out of them, and swapping one person out of the mix might be the thing that changes the experience from being fun to being frustrating. The enjoyment associated with all of the games we cover on Meeple Like Us varies to some degree with group composition. Social deduction games though are fundamentally altered experiences as the people involved are changed. That’s a great strength, but it’s also a massive weakness. I’m occasionally asked how many times I play a game before I review it for Meeple Like Us. The quick, easy answer is ‘enough times’. The real answer, which is even more vague, is ‘only once I think I’ve seen the best of what the game offers’. I’ve been sitting on a review of Spyfall for two years because I never felt that I I’d given it the fairest chance I could to shine. I’d tried it with four and with five, I’d watched other people play it, and I’d asked other people to give it a try and report back. It was only during a few quiet moments during a gaming convention I was staffing on behalf of RGU that I got enough people together to properly kick the tyres of this thing for a while at the ‘best’ player counts BGG recommends. I’ve played this a fair bit, but I was always concerned the real enjoyment lay outside of my well of experience. Spyfall has a hook that is both instantly understandable and utterly baffling. You and your friends begin by selecting a randomly bagged set of cards from the generous selection provided by the game. Carefully, without looking at those cards, you open the bag, remove its contents, and then count out a number equal to the player count minus one. You then slip the spy card into the deck, shuffle it, and deal a card to everyone at the table. Just like that, you’re playing Spyfall and things are about to get weird. See, everyone picks up their card and has a good ol’ look at it so that they know where they are. Everyone is in the same location, although the optional roles that people have within these locations will vary. The spy however has no idea where they are and has to deduce it from how the table behaves. So, that’s weird right? I mean, what kind of spy is on a dangerous infiltration mission and has no idea where they are? Did they just wake up from a coma? Were they kidnapped and brought here in a blindfold? What exactly are they planning to find out about this supermarket? How much trust can their superiors put in the judgement of someone that is surrounded by discount toilet paper and still thinks they might be in a nightclub? The whole premise asks considerably more questions than it answers and the game itself is pointedly, conspicuously silent on the matter. “One player is always a spy who doesn’t know where they are”, the manual unhelpfully explains in the overview. Why? Why? WHY?? Okay, fine – it doesn’t actually matter, but this keeps me awake at nights. There’s a dreadfully pretentious concept in gaming studies called ludonarrative dissonance. It’s a fancy way of describing situations where the game mechanics undermine the storytelling. It’s a somewhat flawed idea because it heavily implies that the systems (the ludic part) and the story (the narrative) are different things and that’s usually not really the case as Brenda Romero highlights in her experimental game series, ‘the mechanic is the message’. These are synergistic systems, not systems in opposition. There is no inherent reason why the game systems cannot be part of the storytelling and in good games that’s what they are. The things you do in a game are as much about the narrative as everything else. Spyfall though is a game where the mechanisms are utterly at war with the conceits of the framing. You don’t really feel like a spy – the experience of Spyfall is more akin to being a baffled tourist that got on the wrong train in an intensely foreign country. 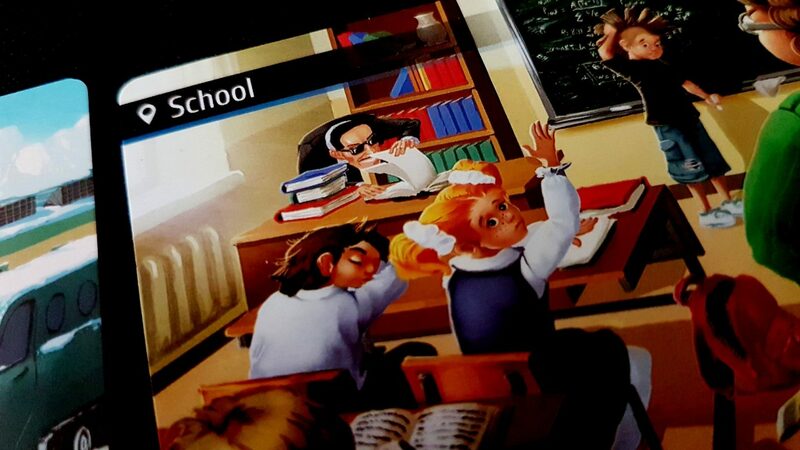 “This game offers everyone an opportunity to walk a mile in the shoes of both a spy who’s close to having their cover blown and the special agent who’s hot on the spy’s heels”, claims the manual. No, it really doesn’t. It gives the opportunity of trying to negotiate your way out of a border check when you don’t speak the language and can’t remember how you got there. As a simulation of espionage it is completely awful. As training for Brits traveling in Europe after Brexit… well, all I’m saying in there is a great retheme here if someone wants to make it. Here’s where it becomes challenging – if Pauline says “Oh, the freshly baked bread from the bakery” it’s almost certainly the case the spy will break cover and say “We’re at the supermarket!”. Every round is picked from a central repository of locations, and so there’s a limited number of options the spy must eliminate from the enquiry. The spy is trying to glean every single nugget of actionable intelligence from a group of people who desperately don’t want to provide it. That’s another weird thing, right? Why is everyone in this supermarket so damn cagey about where they are? It’s like everyone suddenly learned about the uncertainty principle but didn’t quite understand what it meant. Everyone is just heading where they are facing because they think otherwise they’ll be frozen motionless forever in the fresh produce aisle. God, whatever. Let it go, Michael. It’s weird, we get it. Pauline doesn’t want to answer with clear information. Instead, Pauline might answer “Unfortunately, it’s just the recycled air”. That conveys information to everyone else around the table but only helps the spy a little. They can probably eliminate the pirate ship and the beach from their shortlist – maybe the crusader army too. However, the role that each player may be taking on in the location varies from round to round. There’s likely to be someone on a pirate ship who’s stuck down in the hold, and even at the beach someone has to be staffing the front desk. I assume there are front desks at a beach. I try not to go outside if I can help it. Now it’s the spy’s turn to provide an answer that is vague enough to hide the fact they don’t know where they are, but specific enough that it moves suspicion off of them. As you might imagine, that’s tricky enough to do if you’ve had several circuits of the table to accumulate clues – it’s almost impossible to do well if you’re put on the spot early. Being the spy in Spyfall can be intensely stressful if you don’t want to look like an idiot in front of your friends. Okay, fine – not incriminating but also not conveying any information that would move the spy closer to the trusted inner circle. However, when a player’s suspicions get too hard to bear they can pause the round and call for an accusation. ‘J’accuse!’, they will say, and then the table will get to vote without discussing it. If it’s unanimous, then everyone reveals their cards and the spy, or the non-spies, will win as is appropriate. If there is still disagreement on who the spy might be, the round continues until it eventually reaches the eight minute time limit to which everyone is working. You get one accusation per round and so you need to use it wisely. You can’t just keep going, 12 Angry Men style, until you browbeat everyone into agreeing with you out of sheer exhaustion. The point at which the spy asks questions is where some of the nicer elements of paranoia enter the game. If you’re a source of suspicion, then whoever you’re asking a question of will be ever more reluctant to give you any kind of information to work with. They’ll end up looking as crooked as you do just to ensure you don’t manage to look less crooked than them when you next get to ask. “What’s your favourite thing about being here in this place where we both know we are?”, the spy might inquire. “Probably the people. Roz, what is your view of the people here?”. “I think they’re all too busy to make a good impression. 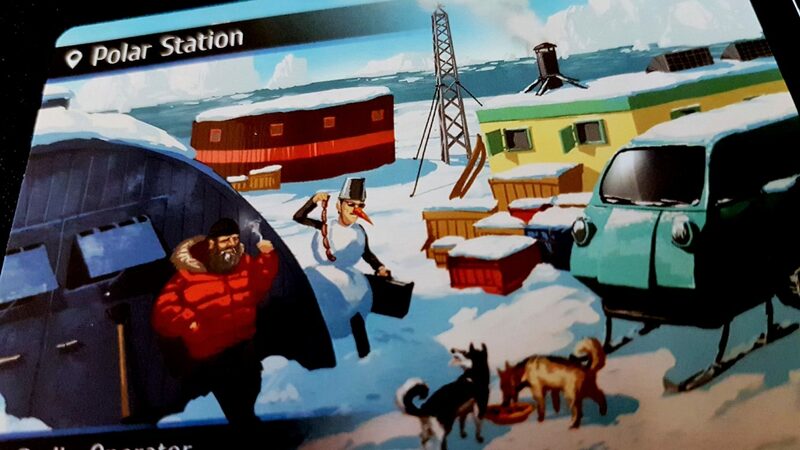 Peter, what’s the worst thing you can hear at the moment?”. Except, of course, all of these answers come from the perspective of someone with a role you might not instantly expect. Perhaps the theatre seems busy because the question was asked of a performer? Was there a piper in the military base? Or is there someone blowing revelry? At best all the spy can do, provided someone hasn’t completely screwed up with an answer, is adjust mental probabilities and try not to look dodgy. It’s rare the spy can come right out and state with authority where they are, but it’s also equally rare the spy hasn’t been able to sow some disagreement as to which of you at the table looks the shiftiest. The spy doesn’t need to look innocent, they just need to look less guilty than someone else. It sounds here like it’s the spy that has the most difficult job, and that’s absolutely true but the spy also has one key advantage – they know everyone else knows where they are. That’s a luxury nobody else has, and as such there’s lots of room to hide in the discussion if you are cagey and can deflect the suspicions away from you. You might flat out copy the implications of an earlier answer, or simply play the odds whilst still avoiding concrete disclosure. Or you might ham up the fact you think your interrogator is the spy and refuse to give them any more information they could use. You might even throw an accusation of your own out there to get people thinking and leave them divided. You need to get something like that lined up, because everyone else arrived here conscious of the destination and you’re the worst spy in the world. 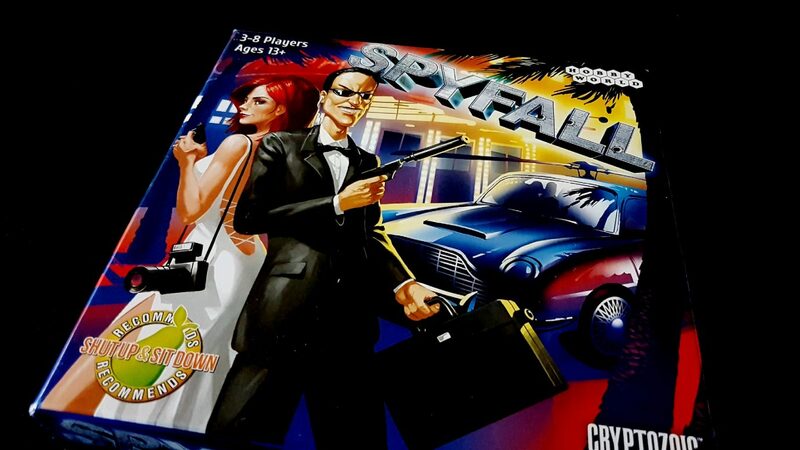 And Spyfall is certainly a good, fun game that isn’t so much James Bond as it is Carry On Espionage. It’s quickfire comic buffoonery that with the right group composition verges upon joyous. If you’re the spy you’re hoping that you can tighten the noose around the possibility space before someone tightens it around your neck. That’s fun, and intense, and gives plenty of opportunities for creative obfuscation and cynical manipulation of the facts as best you understand them. If you’re not a spy, you’re engaged in a constant job of assessing the reactions and responses of everyone while trying to craft answers of your own in such a way as to act as your personal shibboleth to safety. The ticking clock ensures that the whole process doesn’t get to drag on, but all the different tensions you’re trying to relieve, regardless of role, keep it interesting. 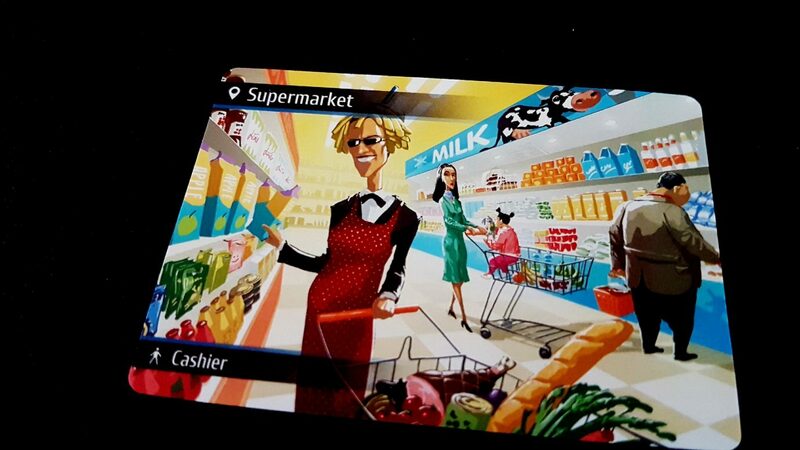 Spyfall comes with a shelf-life, and there’s not much you can really do to extend it. Games like the Resistance or Mafia de Cuba or One Night Ultimate Werewolf all make use of a different model of social deduction. The complexity of the interactions within these games permit, encourage, and sustain an ongoing meta-game that twists and evolves with repeated plays. These games get richer and more interestingly varied as familiarity builds. They develop their own internal lore, and the literacy required for play is low enough that new people make it more interesting and varied still. They are games that are accommodating to new players without the fun degrading for the more experienced players. 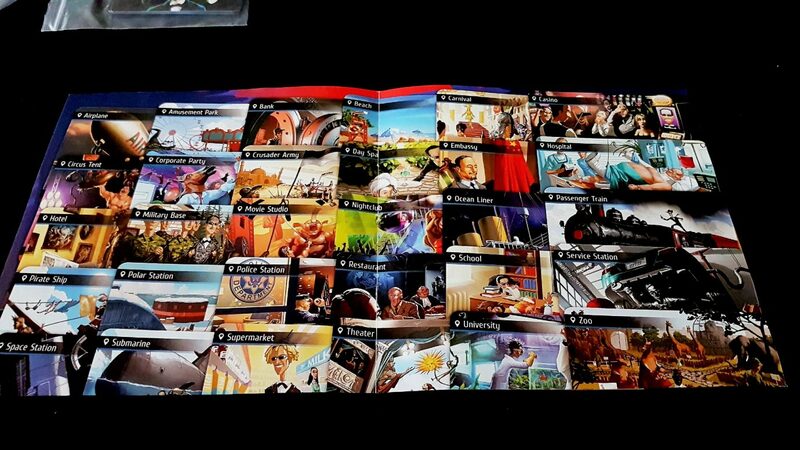 Spyfall is probably, round for round, a more interesting game than any of those others. There’s a lot going on and the model of social interaction it requires spans deceit, obfuscation, paranoia, revelation and omission, silent negotiation and outright bluffing. Those eight minutes are dense with activity even if the game is utterly straightforward in its rules. Your first few exposures to this creates the impression that you’re engaging in a coruscating, ever changing exploration of a vibrantly textured meta-space of discussion and deceit. The spy has a relatively small pool of locations to eliminate from enquiries. As such, eventually play tends to converge upon a local optima where the question set is well worn, the answer set is precisely crafted, and the route to success to any location is reasonably well trodden. As such, introducing a new player into a more experienced group doesn’t add richness or variety – it adds solvability. There is considerable pressure on the spy, and each of the players, to give a satisfying answer and to ask an ambiguous question. Both of those depend on a fair degree of experience, which in turns tends to create a reliable bank of ‘old faithful’ questions. Some of the ones I will ask in almost every game are , ‘What’s your second favourite thing about being here’, or ‘What’s that smell?’, or ‘what’s distracting you most here?’. Those aren’t great questions, but they’re reliable and that’s important. You can ask brilliant and clever questions, but generally you can only ask them once before they’re absorbed into the communal wisdom of play. If someone asks ‘How much did you enjoy the application process for the club’ in an airplane they’ll get plenty of kudos for that round and then that question is worthless for the future. 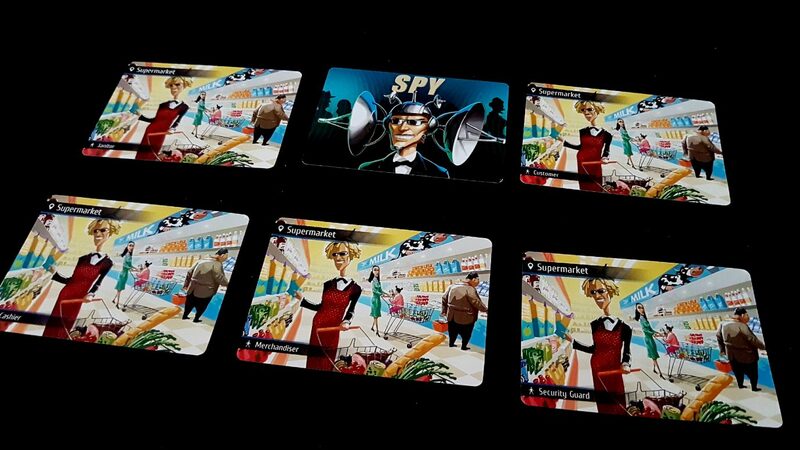 In a lot of games, new players solve this issue by adding in a degree of uncertainty but the barrier to playing Spyfall well is relatively high despite the lightness of the mechanics. You need to be able to come up with good questions, or you’ll mislead the entire table. You need to come up with good answers, or you’ll end up protecting the spy. Spyfall lives and dies on the quality of the questions and answers, and there’s a skill you need to build up before you can meaningfully contribute to that. The end result of all of this is that while you certainly can experiment and play around within the confines of the Spyfall ruleset, you might end up doing more harm than good for your prospects of success. Of course, winning isn’t really the end goal here – it’s having a good time. Over the medium term though Spyfall trends more towards a greatest hits album than it does an act of new and original creation. People bust out the old classics. Everyone sings along. It’s not exactly scripted, but it’s also a far cry from the vibrant improvisation that most likely characterised your first exposure to the game. It’ll become a ‘call and response’ to the in-jokes and personal references of the group. Bear in mind each round is only eight minutes too… medium term here might be reached and then passed in the span of a single evening. And then there are the awkwardnesses around play. We’ll touch on this more in the accessibility teardown, but the spy has to choose from twenty four locations and the only reference to these is in the manual. If you need to examine this every time your turn comes around you may as well cut eye-holes in a newspaper and sit there reading it. The compensations for this are awkward – generally we pass the location reference around when we ask a question and then everyone takes a few seconds to look at it. It’s slow, ponderous, and breaks the flow of the game. It also leaks game information because giving a cursory glance and then asking your question can reveal, or imply, your loyalties to the table. That problem eases somewhat with familiarity but twenty four locations is a lot for anyone to fully internalise and mentally reference during the stresses of an eight minute turn. There’s an online version you can use to help alleviate some of this but we review the game as it comes out of the box here. In the end I think the problem I have with Spyfall is that it benefits immensely from exposure to the game, but exposure to the game disincentivises improvisation. It benefits too from a good group of people that know each other well but not completely. It also needs players quick enough with a quip or a response to permit everyone to enjoy playing around with the questions. A badly timed ‘Er’ in Spyfall can be the difference between everyone having fun and nobody having fun. The tension of the spy comes from them feeling the net tighten. The satisfaction of the others comes from tightening that net. Hesitation or uncertainty messes with that like throwing a handful of screws into a car engine. It can be funny to watch the machinery fall apart in a riotously unexpected way, but it’s not exactly something you’ll enjoy very often especially when you needed that car to get to work. For the perfectly balanced group, Spyfall is a riotous experience. 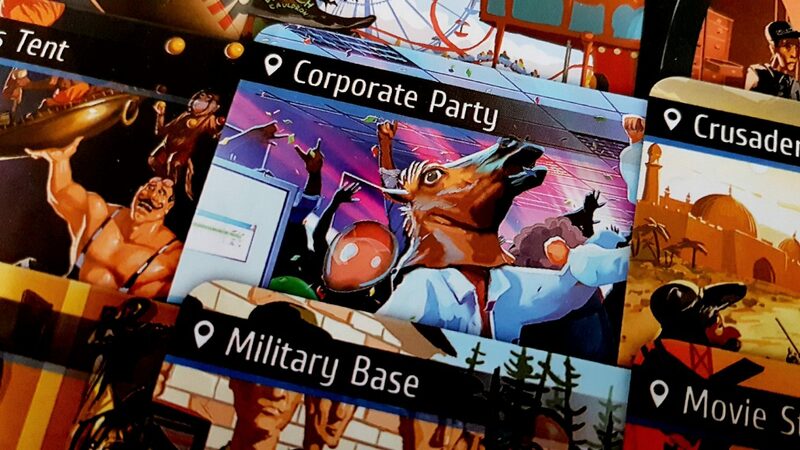 For everyone else, I’d likely point you towards One Night Ultimate Werewolf or the Resistance for this kind of experience with a far more consistent payload of fun.